One of the most popular names for a trail along Lake Michigan is Old Baldy, a dune that everybody climbs for the view of the Great Lake below. 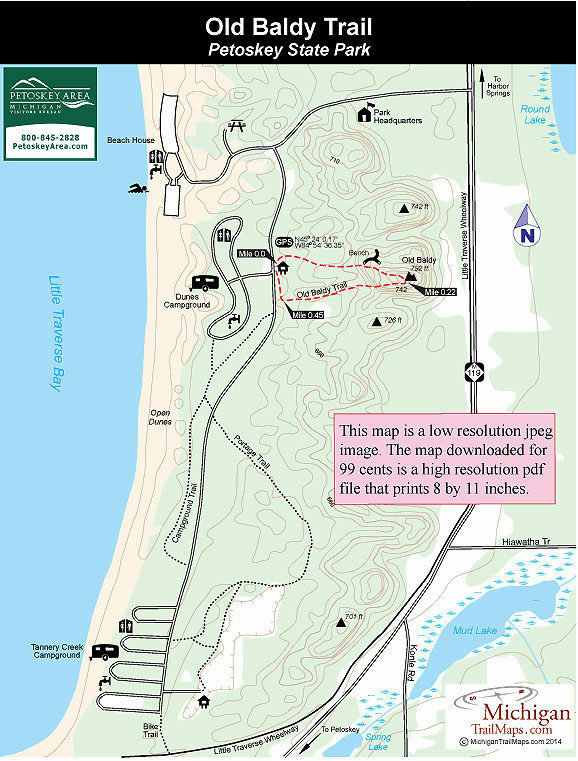 Petoskey State Park is no exception.Its Old Baldy Trail is probably the most popular path in the park, a 0.5-mile loop that climbs to the top of the dune. The trail is picked up at a trailhead opposite of the Campers Registration Office near the entrance of the Dunes Campground. There is limited parking around the trailhead.This is a great hike for very young children who will finish with a great sense of accomplishment. But keep in mind the views are from an observation deck reached on the way and not at the top. One of the most popular names for a trail along Lake Michigan is Old Baldy, a dune that everybody climbs for the view of the Great Lake below. Petoskey State Park is no exception. Its Old Baldy Trail is probably the most popular path in the park, a 0.5-mile loop that climbs to the top of the dune. The trail is picked up at a trailhead opposite of the Camper’s Registration Office near the entrance of the Dunes Campground. There is limited parking around the trailhead. This is a great hike for very young children who will finish with a great sense of accomplishment. But keep in mind the views are from an observation deck reached on the way and not at the top. From the trailhead you begin with an immediate climb up a wooden stairway. 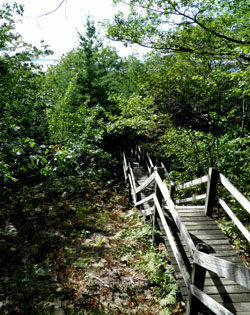 A second stairway is soon tackled and this one ends at an observation deck with a bench reached at Mile 0.16. In a view framed in by foliage you can gaze at Lake Michigan and the fore dunes of the park. The top of Old Baldy is reached at Mile 0.22 with little to look at due to the trees on top. On the other hand you - or your children - are done climbing. The second half of the loop is a rapid descend off the dune that remains in the forest all the way down. You pop out of the trees at the trailhead. The park has 168 sites divided between two campground loops. The Dunes Campground is the original facility and has 70 modern sites in a forested area of low dunes. For as close as they are to each other, these sites are as secluded as any modern campground you’ll find in a state park. The area is heavily forested and the terrain of rolling dunes allows most of the sites to occupy a little nook of their own. The loop is paved but not the spurs and large RVs might have difficulty with some of the sites. Tannery Creek Campground is at the south end of the park and consists of four loops of 98 sites in a level, lightly forested area. Tannery Creek lacks that charming seclusion of the Dunes but four wooden walkways provide access to Little Traverse Bay and at this end the beach is a mixture of sand and pebbles, dismaying to swimmers but a paradise for Petoskey stone hunters. Both loops have restrooms with showers, sanitation stations, firewood bins and tables and grills at each site. At the north end of the park is a shaded picnic area with tables and pedestal grills and the entrance to group campsites. Nearby is the beach and a marked swimming area. Here the shoreline is sandy, wide and enclosed by several dunes. There is a bathhouse/concession store and two parking lots that hold 300 vehicles. The view of the bay is pleasant as you look out over the entire body of water that is often dotted by the colorful spinnakers of sailboats. There is a vehicle entry fee at Petoskey State Park, which is open year-round. The park is 4.5 miles north of downtown Petoskey. Follow US-31 to M-119 and then north (left) for 1.5 miles to the posted entrance. Contact Petoskey State Park (231-347-2311) for information on trail conditions. For lodging or other travel information contact the Petoskey Area Visitors Bureau (231-348-2755, 800-845-2828; www.petoskeyarea.com).